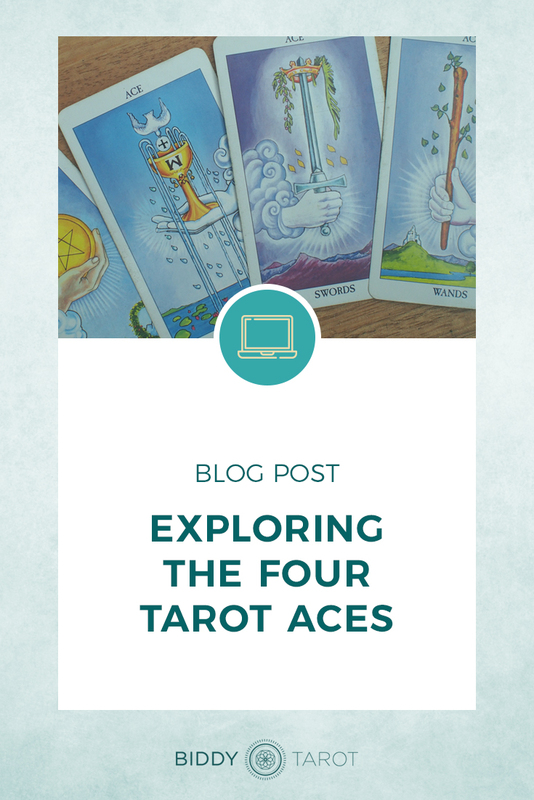 The Four Aces of Tarot – beautiful, bright blessings filled with potential and optimism. In the simplest form, Aces are the very beginning of the numbered cards. There’s Ace, Two, all the way through to the Ten. Acting like a One…and yet at the same time, not. Because when we take into account all the detail and symbolism that lies within each of the 78 cards within the Tarot deck, it shouldn’t be taken lightly that Aces are not called card #1. What do the Tarot Aces Represent? In my opinion the Aces are actually more like a zero – they represent the seed of potential. Just like a seed that’s sitting underground the moment before it sprouts, it is simply the potential of what could happen next, because it hasn’t yet fully manifested. 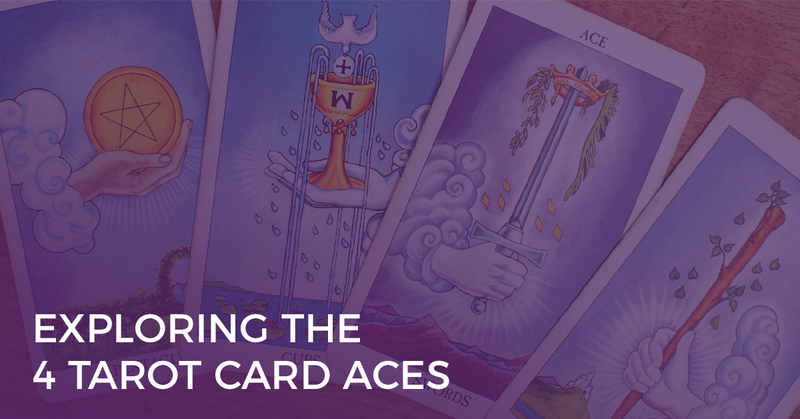 And within any Tarot reading, the Aces show us that possibility. It’s up to us to turn it into something further. To me, the four Tarot Aces are the purest form of energy for each of the suits. Just like the seed, it’s before they’ve actually turned into something. Not only that, but also the absolute purity of what each of their respective suits represent. So, with that in mind, let’s examine each of these Aces and their energy, then what you can do with that energy to bring more of it into your life, and call in more of that potential into your life. In both the Rider-Waite and Everyday Tarot decks, we see a beautiful Cup. It’s overflowing with water, and that water is the representation of the water element that we see with the suit of Cups. 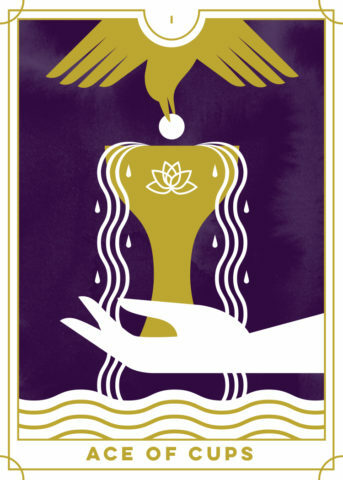 The water is an expression of emotion, and the Ace of Cups is about the potential of feelings and emotional connections. Keep in mind that it’s not the Two of Cups where we have discovered our emotions. Instead, the Ace of Cups is about what is happening within you. In that sense, it’s more like a zero or one, depending on how you want to look at it. This card can traditionally be related to a new relationship, but I see it more as this welling up of emotion within you, and that’s the important thing. Now, the element of water in the Ace of Cups can also pertain to creativity. It may be that you’re feeling your creative potential is starting to well up inside of you, almost like it cannot be contained, as seen in the overflowing water in the card. Or maybe it’s your emotions or love that can’t be contained. Perhaps you’re just starting to have the sensation that you are an intuitive being and that there is a possibility and potential that you have intuitive insight into the world. Of course, we all have that, but the Ace of Cups means that is it coming into your conscious awareness. To manifest the energy for the Ace of Cups, pull out the card from your deck and really sink into the imagery. Gaze at the card and take your time. See what stands out to you. Drink in the story and symbolism into your subconscious mind. How can I bring pure love and compassion into this new journey that is emerging? How can I open myself up to give and receive love? How can I express my whole self fully and authentically? The Ace of Pentacles card in the Rider-Waite deck shows a beautiful little clouded hand holding a coin in the foreground. In the background there is a hedge, archway, and some mountains. 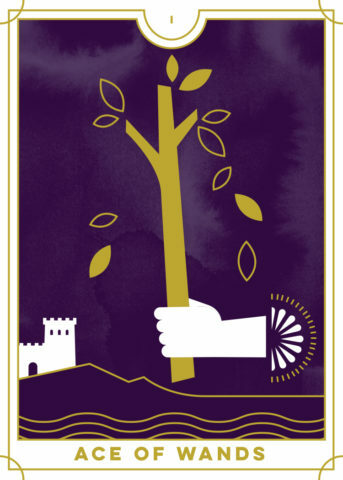 With the Everyday Tarot deck, we see a very similar image, with a hand holding a large coin and trees in the background. This card represents the potential of manifesting something into being. Because it’s the suit of Pentacles, it’s often associated with financial gain or opportunity. It might also be something tangible, like a new product or even a house. Notice the mountains or trees in the background. They signify that the potential for this opportunity is huge. However, you will also have a difficult journey to travel and it’s important that you’re ready for that. 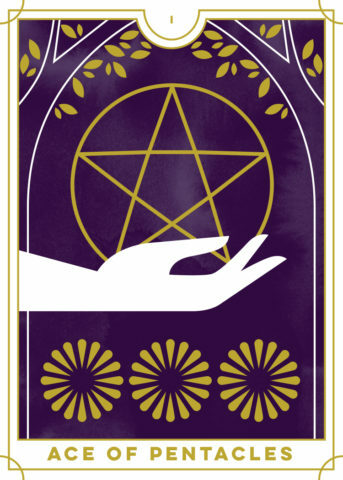 Again, pull the Ace of Pentacles card out of your deck and connect in with the energy of this card. Look at the symbols and imagery. See what sinks into your mind. What new opportunities are emerging that will help me start new endeavours? What can I bring into being at this time? What is coming into fruition? Am I ready for the journey that follows? It’s that amazing moment when all your thoughts come together and create something absolutely new, and the feelings of success, victory, optimism, and being ready to take action. Again, this card does not mean that success and the victory are guaranteed – which is the case with all of the Aces. It’s simply showing you that the potential is there. Now, it’s up to you to take action to manifest that potential. Again, drink in the images and the symbols. See what stands out to you in the Ace of Swords. What do you notice as you look at this card? What energy do you feel? What can I do to gain mental clarity? What is this breakthrough moment that is coming to me? 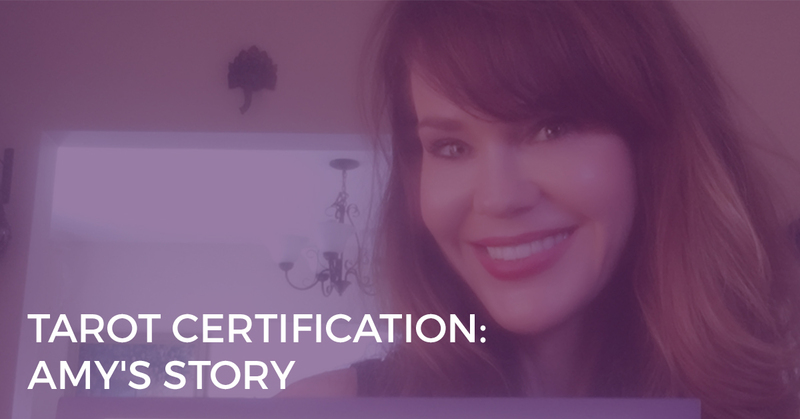 How can I get clarity with your new journey? How can I communicate this clarity to others? When looking at the Rider-Waite deck, once again we see a clouded hand and the Everyday Tarot deck shows the hand suspended. But now, it’s holding a Wand up toward the sky. Leaves are sprouting from the Wand and starting to fall down to the ground. In the background, we have a castle and a few more mountains—again, another symbol that important things take work. You may be thinking, “This sounds an awful lot like the Ace of Swords.” It’s easy to get the two mixed up. 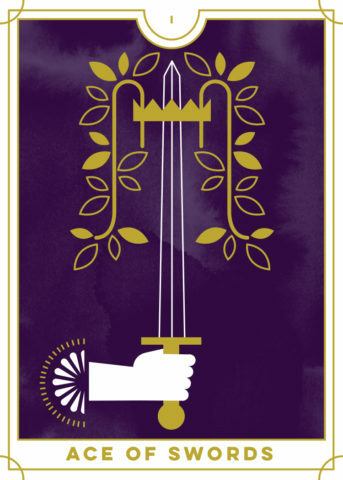 The Ace of Swords is more about the clarity of thought, whereas the Ace of Wands is more about the inspiration. It’s the energy and motivation that comes with that particular level of potential. This inspiration may have come to you through a source that you can’t necessarily label. Perhaps it simply popped into your mind. Maybe you want to make a difference or start a new project. The Ace of Wands is seen when you feel intuitively called to do something, but you can’t necessarily explain why. Once more, take the card out of your deck taking in the imagery and symbols in the Ace of Wands. What is this new source of inspiration that’s coming to me? How can I open your mind up to the new sources of inspiration that are available to me now? How can I connect into my innate wisdom, the universal wisdom so that I am ready to receive whatever messages are out there for me? 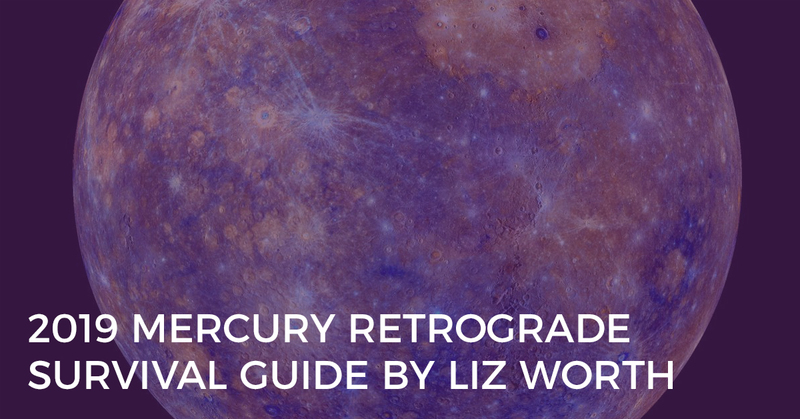 How can I channel this beautiful, intuitive insight into something real and something meaningful? Which Ace will Support You Next? Then, have that Ace with you so that it can help you connect to certain seed of potential that you are bringing into being. I think you’ll find that the Ace has a powerful and beautiful energy that will help you out. And the more you explore the Aces, the more connected you’ll feel to their energy. 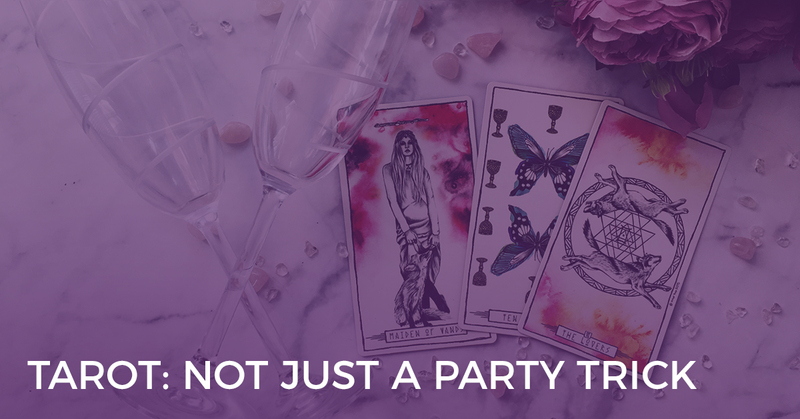 If you enjoy the Ace cards above, then you’ll love our Everyday Tarot Kit. 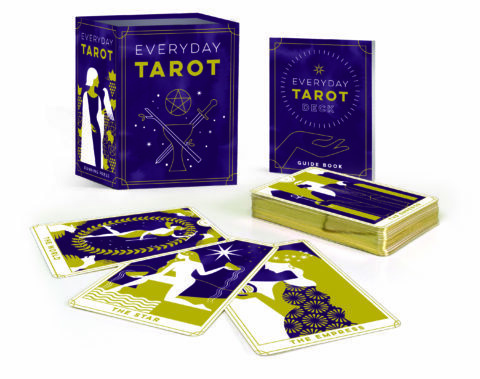 It offers a fresh approach to Tarot, with a modern, beautifully illustrated deck, a helpful guide to the cards, and a beautiful keepsake box. 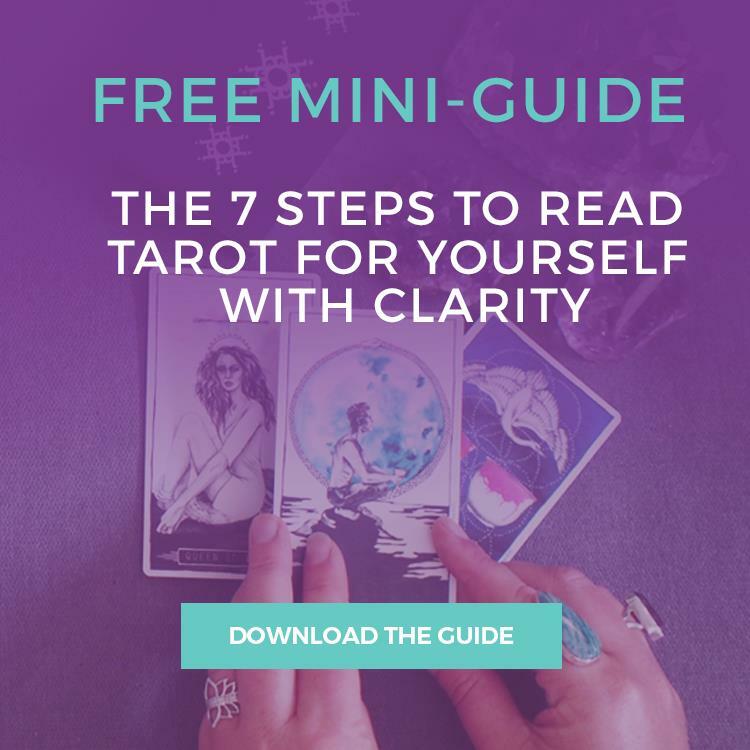 Everyday Tarot brings a new perspective to the cards, giving modern soul-seekers the tools they need to access their inner wisdom and create an inspired life. This charming package, featuring stunning cards and a magnetic closure, will appeal to Tarot veterans and novices alike! You can order yours here.